It may shock some folks to learn that San Francisco created a plan to make the streets safer for pedestrians almost 45 years ago. In 1973 the first iteration of the Transit-First Policy was adopted. It specifically states that the city should do what it can to prioritize alternate methods of transportation of auto traffic. While many folks through the years have argued about exactly what that meant, the intent was clear—a car-centric mentality only increases overcrowding, leads to congestion, and increases accidents. But how do you go from that basic framework to today’s Vision Zero policies which aim to stamp out all fatal auto and pedestrian accidents in San Francisco by 2024? While much of the language in the original 1973 policy was officially worked into the city’s charter in 1999, it’s clear that there was little commitment behind those words. As the population of San Francisco exploded, an influx of automobiles followed. While the city tried to maintain a solid mass transit presence within city limits, it was clear that most folks commuted via automobile every day. But while many of the outlying communities were underserved by San Francisco’s public transportation system, even a significant number of short commutes involved private automobiles. Registrations jumped to almost 464,000 in 2013—nearly one car for every two Franciscans! Pedestrian-involved accidents reached new heights. Even as San Francisco adopted the 2006 version of its Better Streets Policy (specifically stating that public streets be designed and intended for all types of transportation—including foot and bicycle traffic) many areas quickly became overrun by cars. Crowded neighborhoods like The Mission District were notorious for cramming foot traffic and bicyclists into high-traffic corridors where cars (routinely travelling above the posted limits) whizzed by within inches. 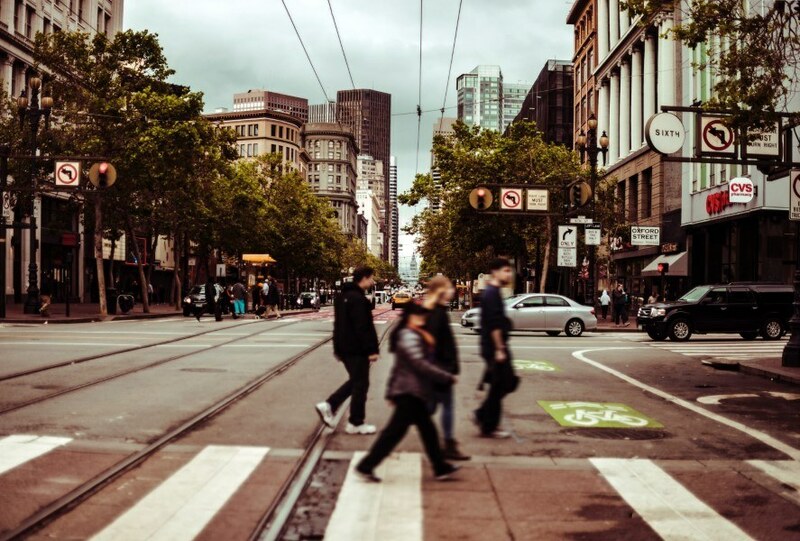 In 2010 the Complete Streets Policy was adopted by San Francisco and mandated that improvements aimed at increasing alternate forms of transportation (including foot traffic) be included in any planning or construction project in the public right of way. But it’s difficult to tell what sort of improvements need to be made when very little was understood about the nature of pedestrian accidents in San Francisco. While the intent was spot on, the execution was lack-luster and resulted in few tangible results. The number of people killed on San Francisco streets finally reached the breaking point. Whether it was the romance of owning a car as part of The American Dream or the perceived necessity of it, San Francisco quickly became a dangerous place for pedestrians. In fact, by 2014 the number of fatal pedestrian accidents in San Francisco had outpaced similarly-sized urban areas across the country. Simply walking across the street became an exercise in faith. City planners knew that things had to change and that now was the time (something us San Francisco personal injury lawyers have known for a while.) They looked to other major urban areas around the world which had adopted Vision Zero policies for guidance. This movement (which began in Sweden) utilizes accurate crash data tracking to pinpoint actual hotspots and hazards within city limits. Planners can then focus improvement funds on those areas and make effective changes—getting the most bang for their buck. And while much has been made about the financial investment and street re-engineering projects completed under the umbrella of Vision Zero, many people gloss over the true heart of the project. Vision Zero is, at its most basic, a blueprint which San Francisco can use to actually achieve the intent of planners from the past who crafted and instituted these previous transportation policies. By giving planners the data and funding they need to make radical changes within city limits, Vision Zero lets them create a city less dependent on automobiles and friendlier to alternative forms of transportation including bicycle and foot traffic. By giving pedestrians and cyclists the resources they need (like dedicated bike lanes, pedestrian safe zones, improved crosswalks, and increased enforcement efforts) Vision Zero allows them to carve out their own place in the commuting society. Combined these intertwined paradigm shifts may ultimately decrease the number of bicycle and pedestrian accidents in San Francisco. However, these changes won’t be effective overnight. There will still be crashes. There will still be injuries. There will still be lives tossed into chaos. And when that happens Sally Morin’s team of dedicated pedestrian accident lawyers in San Francisco is here to help. We’ve been providing expert legal assistance to seriously injured San Franciscans for over a decade—winning financial compensations for victims of reckless drivers both in and out of court. If you’ve been seriously injured and need legal help to get your life back in order quickly, contact Sally Morin Personal Injury Lawyers today. Call (415) 413-0033 today or submit your case online to get help now.